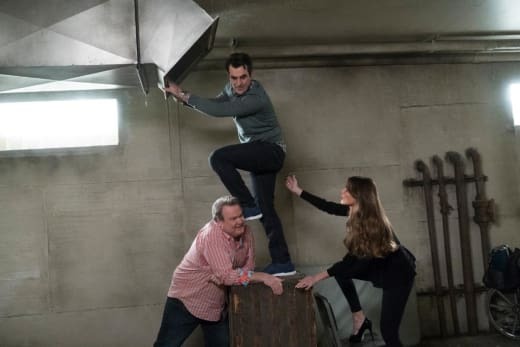 They are on a roll again on Modern Family Season 9 Episode 21! The beginning of this season must have been just a small slump because I really like the last couple of episodes. They remind me of the comedy from the first few years of Modern Family. Let's start with the best storyline, Haley Dunphy. She was all set to meet Arvin's dad and excited about it, but Arvin's mom shows up and throws a monkey wrench into the whole meet. Typical. Dad is easy-going, mom's the tyrant. Either way, Arvin dropped the ball, making it seem like he was ashamed of Haley and what she does. That's not who Arvin is, and Haley should've known better. He's just awkward! I don't think Arvin has a mean bone in his whole body. Yes, he seemed to be embarrassed by Haley, but even I recognized Arvin was trying to shield her from his nutty mother. I've been struggling with Haley pairing up with anyone, since her relationship with Andy, but I like Arvin. As I said, he's awkward, but in a good way, and you can tell he cares for Haley. Arvin's just intimidated by his mother, so he came off wrong. I'm glad Haley decided to forgive Arvin, and tell him that she loves him. No, you made me feel bad about myself, and I deserve better than that. Ok? Permalink: No, you made me feel bad about myself, and I deserve better than that. Ok? It was so funny how they brought all of Haley's boyfriends in, one at a time, to see her in the hospital. One thing that's so important for me, when we're talking comedy, is timing. I find so few shows get the timing of the comedy right, and it doesn't work. The way they brought in the boyfriends was layered, and it was done so well, that it made me laugh, even before they spoke. Confession! When Andy said he had a girlfriend, my heart broke a little. All was well again, though, when Arvin popped in and professed his love for Haley. I hope they grow their relationship because I can see her marrying Arvin. She's at that point in her life where I can see it happening. With everyone else, the timing wasn't right, or the pairing was off, but Haley and Arvin just fit. 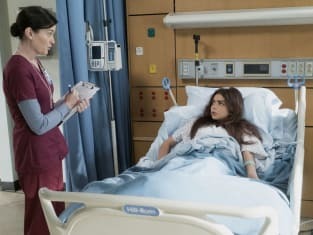 I didn't enjoy the whole Aunt Becky hospital trip. I know it was supposed to be funny how Claire, Mitch, and Jay were trying to get what they wanted by fooling a stroke victim. Look at that sentence, though. They were trying to get what they wanted by fooling a stroke victim. I know it's a comedy, but come on! This is your sister, Jay! Becky may be a big fat jerk-face and, yes, she was playing you all, but she didn't deserve that. The timing? It was way off. They paint Jay, Mitchell, and Claire as so petty. I never thought they were, but maybe they are. It's not a good look. Did you ever notice it's always the non-Pritchetts who slip away together to go off and do fun things on their own? Last season, Gloria, Cam, and Phil were having secret meetings to plan how to manipulate the Pritchetts into getting what they wanted. A trip to Italy. Wait, I see a theme here. Anyway, Gloria, Cam, and Phil slip away (again) to get trapped in an Escape room, only to get trapped in a room they have to escape. I like the way those three play off each other. They're not neurotic like the Pritchetts, and I always have a good time watching them interact. Of course, the writers played on Gloria's Columbian background, like she's some drug-sniffing K-9, but the irony of getting stuck in a room to escape while looking for an escape room, I found funny. 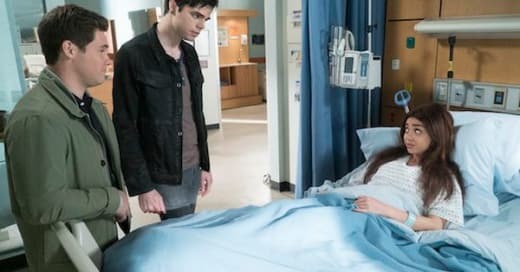 What did you think of Haley's boyfriends coming to visit? How did you feel about seeing Andy? Were you as turned off about fooling a stroke victim as I was? Do I need to loosen up? Tell me! I'd love to know your thoughts about the episode. We're in our last couple of episodes for Modern Family Season 9. Have you missed any episodes? You can catch up and watch Modern Family online here on TV Fanatic. When you're done, catch up on all your other favorite shows and join in on the conversation. We love to talk TV with other TV Fanatics like us!